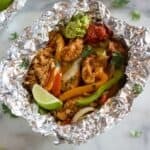 Chicken Fajitas Foil Packets with seasoned chicken, rice, bell peppers, and onion cooked together in tin foil for an easy all-in-one tin foil dinner. Cook them on the grill, in a campfire, or even in the oven, so you can enjoy them all year round. Combine rice, water, and 2 tablespoons taco seasoning and stir. Set aside for 5 minutes. Add chicken, bell peppers and onion to a large bowl. Drizzle with oil, and season with the remaining taco seasoning packet, stirring gently to evenly coat everything. Coat four large pieces (about 12'' long) of tinfoil with cooking spray. Divide the rice and remaining liquid evenly between the pieces of tinfoil. Add chicken and vegetables on top. Bring the sides of the tinfoil up, sealing the tinfoil closed to form foil packs, ready to cook. Preheat grill to medium heat. Add foil packets and close lid. Cook on medium to medium-high heat, depending on your grill, for about 10-13 minutes or until chicken is cooked through. Add desired toppings and enjoy! Preheat oven to 425 degrees F. Place the foil packets on a baking tray and cook for 15-20 minutes or until chicken is cooked through. Add desired toppings and enjoy! Cook in the hot coals of a campfire for about 20 minutes, or until chicken is cooked through. Add desired toppings and enjoy!